For the second time in a little over 3 months, record rainfall has brought flooding to Nashville and other parts of middle Tennessee. Fortunately, no deaths or serious injuries have been reported, but there have been numerous road closures and water rescues as a result of the downpours. The month-to-date rainfall total now stands at 6.35 inches. Since June 1, a total of 17.17 inches of rain has fallen . 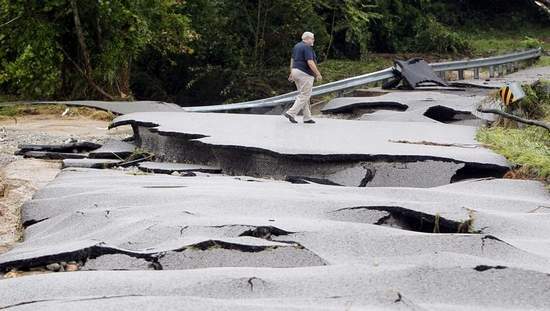 . .
For the year, Nashville has seen 47.50 inches of rain. 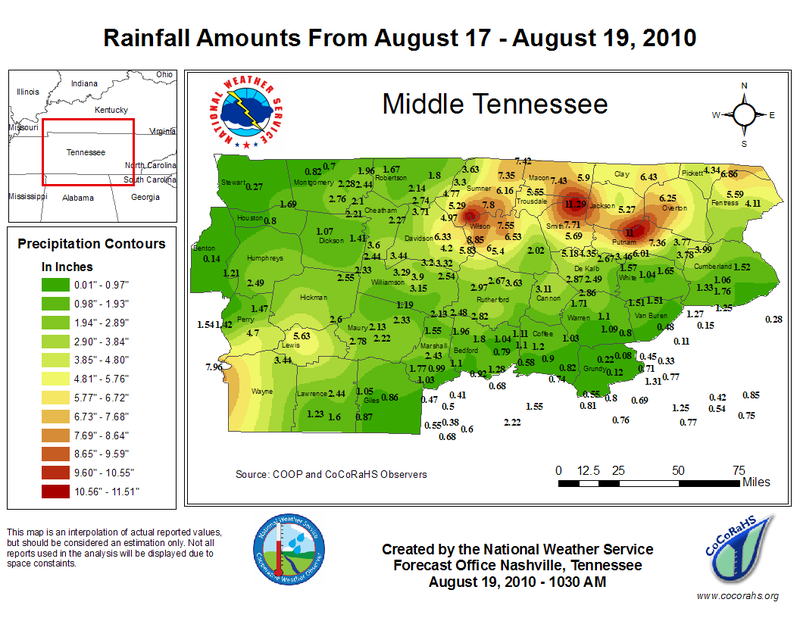 Only two other times has Nashville experienced this much rain by August 19. The last time was in 1950, when 47.84 inches of rain had been recorded through August 19. Before that, we have to go all the way back to 1882, when 53.38 inches had accumulated through August 19. 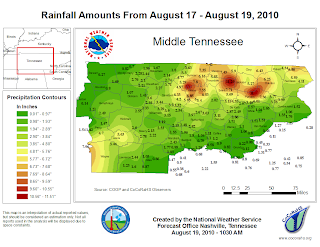 Normal year-to-date rainfall at Nashville is 31.34 inches, meaning that we`re currently running at 152% of normal. In addition, normal yearly rainfall is 48.11, so the city could actually go dry for the remainder of the year and still end up very close to its normal annual rainfall. The Richmond Times-Dispatch reports that a ruling has been delayed in a case regarding Virginia Attorney General Ken Cuccinelli's demand for all documents and emails from the University of Virginia involving climate researcher Michael Mann, who worked at the university from 1999 to 2005. Albemarle County Circuit Court judge Paul Peatross announced this afternoon that he would make a decision on the case within 10 days. UVA administrators have strongly opposed the Attorney General's subpoena on the basis that it puts a "severe chill on academic freedom and scientific debate." Four organizations have also filed briefs in support of the UVA position. They are: ACLU of Virginia, the American Association of University Professors, the Union of Concerned Scientists and the Albemarle County-based Thomas Jefferson Center for the Protection of Free Expression. Students, faculty, and alumni held a small rally on campus this afternoon to protest the case. Last year he stumbled over his words in a live broadcast and forecast a "muddy sh*te" for Glastonbury instead of a "muddy site". He was also forced to make an apology after referring to the Outer Hebrides or Western Isles of Scotland as "nowheresville" in a weather bulletin in February 2007. Early this year Tomasz caused controversy when he posed without his top on for the cover of Active - a supplement in gay magazine, Attitude. "The News Channel presenter in the studio acknowledged a mistake had been made, and we apologise for any offence caused," a BBC spokesman said. "Tomasz was not aware that he was on air, and whilst the gesture was only shown for a second, it was not acceptable." And, you guessed it... Schafernaker again who couldn't stop laughing after BBC News presenter Simon McCoy – him again! – suggested he had a "frozen ball". "Just the one," replied TS. Schafernaker, who as well as predicting warm fronts has quite an impressive front himself (as revealed in Attitude magazine earlier this year) has also been known to break into song, read out the wrong forecast and occasionally make no sense whatsoever. Following highs of 98° and 97° on Tuesday and Wednesday, temperatures cooled through the weekend with highs of only 80° on Friday and Sunday. These were the lowest daily highs since the temperature last failed to reach 80° on June 9. Today is the 68th consecutive day with temperatures of 80° or higher. Today's preliminary high was 91° after a low so far of 74°. This makes the daily average 5° above average. 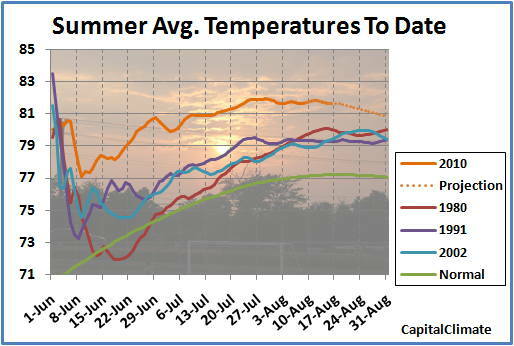 Friday, August 13, through Sunday, August 15, were the first 3 consecutive days below average since the first 3 days of July, but they were only below average by 1° each. Overall, the August average has declined slightly from its peak to 80.9°, which is 2.4° above average. If it continues at this rate, this month will be the 6th warmest August on record. The summer average to date is 81.6°, which continues well above the previous record pace. 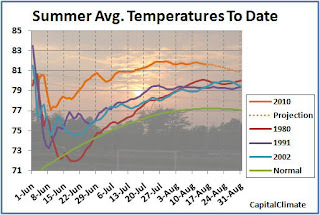 If temperatures for the rest of the month merely equal the long-term average, the summer will still easily break the record with a temperature of 80.8°. In fact, however, temperatures in the coming week as well as into the extended range are forecast to be above average. August 18 Update: The streak ended yesterday (August 17) with a high of 79°. At 10 am local time today, Chicago reached a temperature of 81°. This is now the 45th consecutive day that temperatures have been 80° or higher at Chicago in a streak which began on July 2. According to Tom Skilling's ChicagoWeatherCenter blog, the city set a record of 28 consecutive days above 80° on July 2-29. 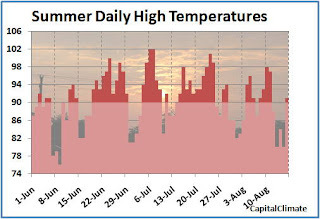 Counting temperatures of 80° or higher, the current streak exceeds the 42 days from June 27 to Aug. 7, 1955. The average temperature of 77.7° in July at Chicago was the 7th warmest on record. July was also a very wet month; the 8.84" of precipitation was the 3rd wettest on record. The current forecast calls for high temperatures in the low to mid 80s each day through next Saturday.